A huge well done to my mate Graham Hill over in south east Ireland - he landed a bass of just over 14lbs on Sunday morning on a lure. That is some fish !! This without doubt proves a couple of things that I have been banging on about for some time now - that Ireland offers some of the finest shore fishing for bass that there is, and that Graham is one of the most accomplished anglers that I have had the pleasure to fish with and work around. I know how hard he works at his fishing and how much thought he pits into it, and the rewards keep on coming. I am over the moon for the man. We spoke on Saturday evening and he told me of his plans to head out early the next morning because the tides and conditions were just about perfect, so I was half expecting some kind of message the next morning. 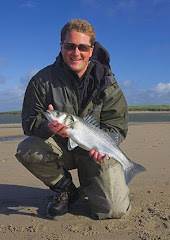 Graham has six bass on lures, with the best going over the 14lb mark (you can see a photo and further details here). I have never even seen a bass that big, but the guys over there believe there are far bigger fish around, and I know that Graham has had a couple even larger himself. Whilst it was a great text message to read, in all honesty the news did not surprise me that much - he's an awesome angler and he is fishing an awesome bit of coastline. I am over there later next week and I can't wait. I am hoping to get the chance to photograph a bit of cod and bass fishing, plus whatever the weather and conditions throw at us. The successful lure for this monster bass was I believe the very same white/silver Tide Minnow Surf that I was talking about the other day, see here. Sometimes you just get a feeling about certain lures, and I guess that Graham felt the same way !! You can get these bass slayers right here. All the Duo Tide Minnow lures seem to cast and fish fantastically well. Below is Graham with a roughly 9lb bass that he nailed back in July when I was over photographing with him and a bunch of Jersey bass freaks. See the photos from that trip right here. We had an epic few days and I know the guys came away somewhat blown away by the quality of the fishing. Honestly, thoughts of moving over there for good are occupying my thoughts a lot these days. But not as much as Iggle Piggle's tune !! Still having problems removing this one from my head - I did not have the heart to break my youngest daughter's Iggle Piggle teddy when they were out on Friday morning, but I did have a glint in my eye when I went downstairs to make a cup of coffee and saw it staring maliciously at me. "I could rip you to pieces in a frenzied rage" were my initial thoughts, but then I managed to reign myself in and think about my girls. I am a mature father of two now, and I am not about to rip an innocent teddy to shreds - perhaps just a little smack in the chops though ? Iggle Piggle is the Devil in disguise. That's a cracker of a bass to catch at any time, but catching it on a lure makes it that bit more extra special!. I nearly managed a week in SW Ireland earlier this year but had to cancel as the Queen needed me elsewhere. Hopefully next year, it looks truly awesome. Now get codding, there's a couple of photos on my blog to wet your appetite... tight lines ! 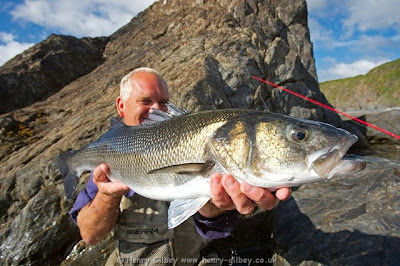 Awesome blog Rob, cod off a kayak is out of this world fishing !! Emaail me if I can ever help out with some Irish info. Fishing junkie who has turned his obsession into a job - writing, photographing, consulting and making TV programmes about fishing all around the world. Is this the largest bass ever caught ? Have I struck a chord ?